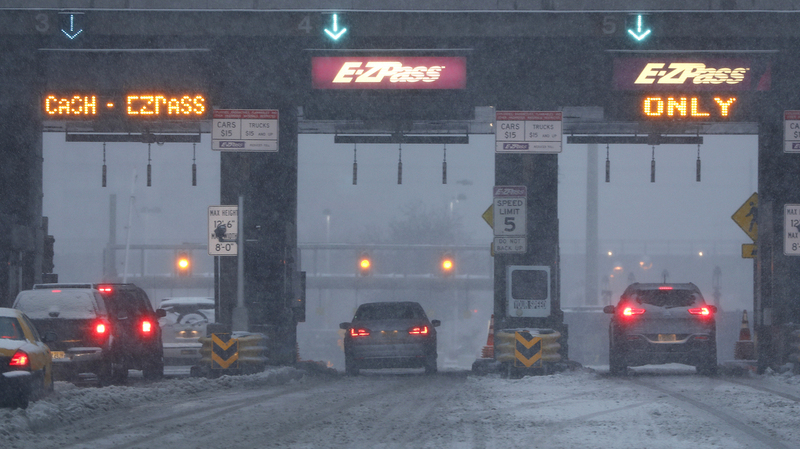 More States Turning To Toll Roads To Raise Cash For Infrastructure Tight budgets and shrinking infrastructure money from Washington have more states hiking tolls and adding tollways to raise money to fix and repair roads and bridges. Vehicles are seen at the toll bridge of the Holland Tunnel as snow covers the road during a snowstorm on Feb. 9, 2017, in Jersey City, N.J. More states are turning to tolls as a way to fund long-standing transportation needs. "I think 2018 is going to be a very good year for tolling," says Pat Jones, executive director of the International Bridge, Tunnel and Turnpike Association, which represents toll facility owners and operators. "We're seeing a number of states that do not currently have tolls express an interest in doing so. States like Connecticut, Michigan, Wyoming and others," Jones says. And some states are beyond considering it. New toll roads or toll lanes are opening this year in Texas, Colorado, Florida, North Carolina and Virginia. Oregon will be adding congestion pricing to highways to help manage congestion in and around Portland later this year. Austin, Texas, has two new toll road projects slated to open next year and the highway tunnel beneath Seattle begins charging tolls in 2019. And rates on many existing toll roads and bridges around the country went up on the first of the year, including on the Pennsylvania Turnpike, on the Triangle Expressway in Raleigh, N.C., and for the tunnels in Hampton Roads, Va., while voters in the San Francisco area may be asked later this year to raise tolls on bay area bridges. The reason for this surge? Many states' transportation budgets are tight and highway funding from Washington is lacking: the federal highway trust fund is nearly insolvent, as the federal gas tax hasn't been increased in 24 years. "So states are in many cases on their own," Jones says. "They are looking for revenues and tolling is a powerful and effective way and a very specific way to pay for new infrastructure as well as generate funds to pay for existing infrastructure." Many states are turning to tolling after trying to shore up transportation and infrastructure funding with their own gasoline tax increases. Davis notes that 26 states have increased their gas taxes since 2013, eight of them just last year. "It's very unusual to see the states in such lock-step on this issue, especially when it comes to tax increases," he says, adding that it just underscores how the lack of federal infrastructure funding has hurt states. The Trump administration is preparing to announce a new national infrastructure plan in the coming weeks that the president has promised would invest a trillion dollars in the nation's crumbling roads, rails, bridges, airports, tunnels, dams, levees and water systems. But only $200 billion of that will likely be coming from the federal treasury. The administration is planning to use that money to match and leverage the rest from state and local governments and the private sector. The U. S. Chamber of Commerce would prefer a much bigger federal investment, and called Thursday for an increase in the federal gas tax of 25-cents a gallon, phased in over five years. The business group and many others have long been calling for a boost in the gas tax, which is now 18.4 cents a gallon and hasn't been increased since 1993. But gas tax increases have long been opposed by Republicans controlling Congress. That means the transportation funding burden may continue to fall more heavily on states, and ITEP's Davis says it will be tough for many states to come up with their share. "With so many states already having dug deep to come up with more money for infrastructure, they're really going to have to start scrounging through the couch cushions, looking for whatever they can, if they want to participate in a new federal program of the type that's being talked about." That could mean more gas tax increases, if states feel there's room, but it also likely means a heavier reliance on tolls. "Which is unfortunate because they really are the worst funding mechanism available," says Stephanie Kane, spokesperson for the Alliance for Toll-Free Interstates. "No other road funding mechanisms come with half as long a list of drawbacks and disruptions for the communities where they're located." Kane says when you turn a freeway into a tollway, drivers will go out of their way to avoid the tolls. "So you have this awful traffic diversion. Cars end up on secondary roads that were not built to have that volume of traffic, the roads that are surrounding the toll get torn up more quickly, the local communities see a lot more congestion," she says. Kane also contends that tolls are a regressive double tax on top of fuel taxes and often disproportionately hurt lower income drivers. And she says tollways are an inefficient way to collect revenue, as 8 to 11 cents of every dollar collected goes to administrative overhead, collecting the tolls and contruction of electronic tolling apparatus on the roads. Despite those drawbacks, Kane says members of the Alliance for Toll-Free Interstates, which includes trucking and shipping companies, including Werner Enterprises and UPS, are "extremely concerned about how much the Trump administration's infrastructure package will rely on tolling." Some drivers are concerned, too. "Everything seems like it's getting more expensive," says Nick Pariseman, as he walked his 8-week old puppy at a travel plaza on the I-90 Indiana Toll Road. He was on his way home to Port Clinton, Ohio, from a job site in Iowa and says it's not the price of tolls that bothers him as much as the poor conditions of the roads. So if toll rates go up or more highways are tolled, "If they're up kept how it is, I think it's just going to make people mad," he said. "I think it will just make them mad and they'll take a different route." But North Carolina truck driver Mike Edwards, who was hauling a load from Portage, Ind., to Harrisburg, Pa., doesn't mind paying more tolls. "Actually, I think its a good thing as long as they use the money for what it's supposed to be, fix the roads," said Edwards. But asked what kind of shape the roads are in, he says "They're pretty rough in a lot of places."